Interior Fretwork	There are 8 products. Our range of internal room and hall friezes create a warm and charming entry to hallways and living rooms, enhancing the interior of your home. 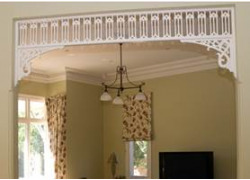 Each piece of internal fretwork is made to order. 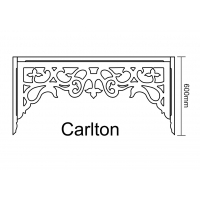 The Carlton is supplied assembled with a 65mm x 32mm frame, with the option of having a beaded, bevelled or square edges on the frame. 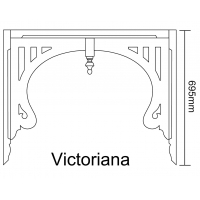 For wide openings you can extend the width of the Arch by repeating the centre pattern. The Carlton is made to the opening sizes provided upon ordering. Available in Hardwood, Clear Pine & Craftwood. Contact us today on 03 9330 2203 or email info@ryanwoodworks.com.au and receive your free quote. 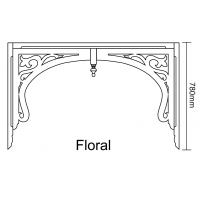 The Dan Hall Arch is supplied assembled with a 65mm x 32mm frame, with the option of having a beaded, bevelled or square edges on the frame. 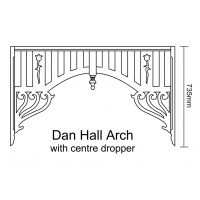 The Dan Hall Arch is available with or without the centre dropper. 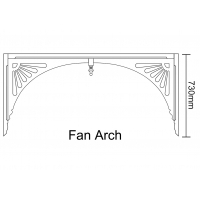 The Dan Hall Arch is made to the opening sizes provided upon ordering. Available in Hardwood, Clear Pine & Craftwood. Contact us today on 03 9330 2203 or email info@ryanwoodworks.com.au and receive your free quote. The Elizabeth Arch is supplied assembled, and made up of CB29 Brackets, P1 motif, squiggles, traditional rails and a beaded frame. 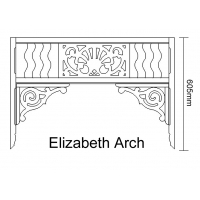 The Elizabeth Arch is made to the opening sizes provided upon ordering. Available in Hardwood & Clear Pine. Contact us today on 03 9330 2203 or email info@ryanwoodworks.com.au and receive your free quote. 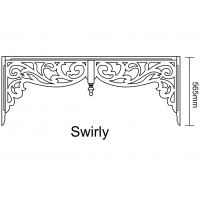 The Swirly is supplied assembled with a 65mm x 32mm frame, with the option of having a beaded, bevelled or square edges on the frame. 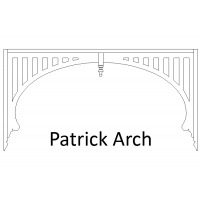 For wide openings you can extend the width of the Arch by adding spacers. The Swirly is made to the opening sizes provided upon ordering. Available in Hardwood, Clear Pine & Craftwood. Contact us today on 03 9330 2203 or email info@ryanwoodworks.com.au and receive your free quote.